Defence news today includes reporting that an RAF Chinook has provided further support to areas of Cumbria isolated by snow drifts following the recent heavy snowfall. Several media outlets today report that an RAF Chinook has flown food and supplies to areas of Cumbria isolated by huge snow drifts, demonstrating further military support following last week's heavy snowfall. Articles are carried across broadcast channels, and on BBC News online, Sky News online and ITV News online. From Scotland to Cornwall, more than 100 personnel from across the forces have been making a real difference in getting nurses and doctors to vulnerable and elderly patients, and helping rescue those left stranded in freezing conditions. I pay tribute to their professionalism, dedication and sense of duty. They are proving once again that Britain can always depend on our troops to protect us no matter the time, no matter the place, and no matter the problem. 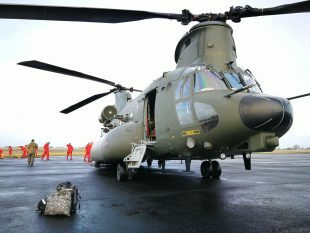 The Chinook helicopter gives the partnership another dimension to be able to deliver vital supplies by air to areas that are cut off by other means. The Daily Telegraph today splashes with an article on the Iraq Historic Allegations Team (IHAT), carrying criticism from a number of people about the way the IHAT dealt with inquiries. It’s totally wrong for people to exaggerate or make up allegations against our brave troops. This causes unnecessary distress for our soldiers and their families, and anyone responsible for false claims should be ashamed. Credible claims should be and are investigated, but false allegations make it harder for justice to be served. A number of media outlets cover comments made by Chief of the Air Staff, Air Chief Marshal Sir Stephen Hillier, during a recent Press Association media interview, in which he focused on the threats the UK faces from Russia and terror groups. The key thing here is, as we have discovered in previous conflicts, is that if we let up, then they will come bouncing back, and we will have to re-engage. We will have to keep going with this one until the job is done. An RAF Chinook has flown food and supplies to areas of Cumbria isolated by snow drifts. Crown Copyright.